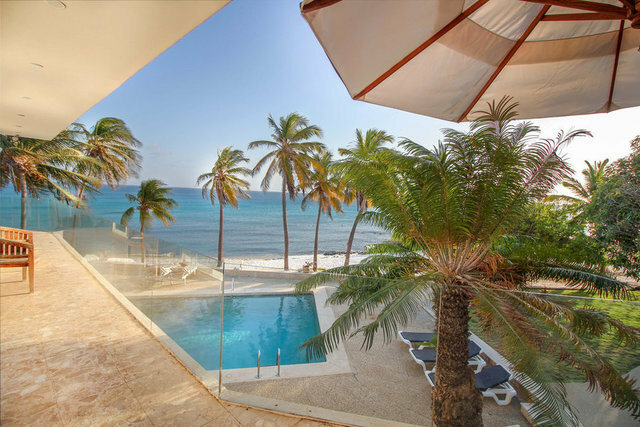 Ocean Edge is situated on an elevated corner lot on Malmok’s prestigious Boca Catalina and Arashi’s Beach, overlooking the turquoise waters of the Caribbean Sea. Ocean Edge is notable for its classical Caribbean Art Deco architecture, extraordinary grounds and commanding daily unobstructed sunset views. This 8 bedrooms estate spans 11,000sq.ft. on 2 levels with dramatic views over the pool and terraces stepping out to the beach. Ocean Edge has everything that an island estate requires including on the main level a formal and informal dining, living area, covered terrace, a gourmet kitchen area, 3 ensuite bedrooms, a master suite featuring a wrap around balcony, 2 additional guest bedrooms, half bath and laundry facility. A signature staircase goes towards the ground level area, which offers 2 ensuits, additional full bathrooms, spacious outdoor entertainment area, a large private pool with built-in entertainment bar, landscaped garden area and gym.